This year’s two Carol Concerts promise to be a wonderful evening of festive music, including audience participation, performed by the renowned local chamber choir Chichester Voices. The concerts will be conducted by Andrew Naylor and will feature some much-loved works including ‘I Saw Three Ships’, “The Twelve Days of Christmas” and “Chestnuts Roasting on an Open Fire”. Also, there will be the world premiere of “Laetabundus” – a sequence for Christmas by local composer & choir member Michael Walsh, and The Bee Carol, composed by choir member David Russell. Audiences will have two chances to hear the concert: Firstly at the RNLI Station, Kingsway, Selsey, PO20 0DL on Saturday 15th December at 7.30pm. 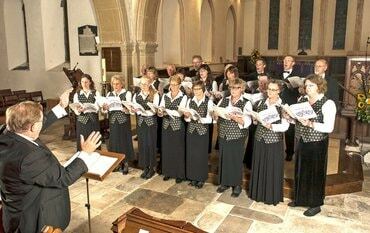 Richard Allum will be at the keyboard & the choir is raising money for Selsey Lifeboats. Then, on Thursday 20th December, again at 7.30pm, the choir will be at their usual home of St Thomas a Becket’s Church, Pagham, PO21 4NU, raising money for Rotary Charities. Directed by Andrew Naylor and accompanied by Richard Allum, tickets for these concerts cost £12 (£10 concessions, children and OAPs). Tickets for the Selsey concert are available from the Selsey RNLI Station shop, at www.selseylifeboats.co.uk and 01243 601822 or Chichester Voices on 07900 098197 and at www.chichestervoices.org.uk and on the door. Tickets for the Pagham concert are available from Rotary on 01243 268288 or Chichester Voices on 07900 098197 and at www.chichestervoices.org.uk and on the door.